Aries people love challenge, and usually try to depend upon no one and nothing but themselves. They believe in being totally honest and true to oneself and one’s own vision, even if that means standing alone. Honesty, integrity, personal honor, and authenticity are their gods, and Ram has no sympathy for weakness. A Ram person usually wants the freedom to do things in his own way, and works very well independently. Cooperating with others or carrying out another’s will is not in Ram’s style, and in such case he would usually prefer to work alone. Ram loves action and is always ready to stir things up or do something new, even if it involves big risks. Routine is like death to Aries person. People under this zodiac are usually spontaneous, impulsive, direct, enthusiastic, and assertive. They believe in the power of positive thinking and positive action, and like to think of themselves as a strong person. They hate being ill or in any way in a position of dependency. Accepting their own human limitations and emotional needs is often difficult for these people. 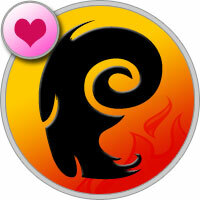 Aries are usually not very good in picking up subtle messages and rarely are they very sensitive or sentimental. Often they are so fired up about their own projects or goals that they inadvertently run over or ignore other people’s feelings and interests. Their impatience to get on with things causes them to be rather insensitive, and to therefore alienate others unnecessarily. Ram individuals would gain much by learning to slow down, relax, and just let things be, but their energetic, restless nature rarely allows doing this.